Enchanted Lion Books, 9781592701100, 208pp. Mother and father, dancers and warriors, gardener and farmer, hypnotist and genie. . . . All sorts of people appear in People, linked together in ways that begin to emerge page after page. Real, mythic, and imaginary types inhabit this extraordinary, gorgeously rendered world, referring to each other through form and function. Like Blexbolex's earlier book Seasons, this is a conceptual book, where the connections between the images are both clear and subtle. 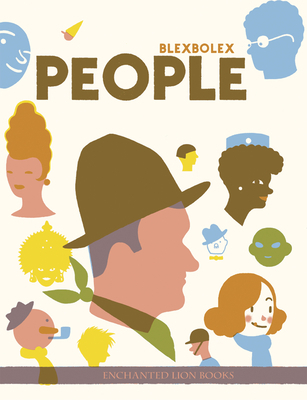 Stunningly illustrated with retro-looking silkscreened images, People is a sumptuously produced volume, with a lavishly illustrated jacket that folds out into a poster. The manner of the realization and the quality of the book are so strong that People (as did Seasons) serves to reminds us once again what a book can be at its very best. Seasons was a New York Times Best Illustrated Book of 2010 and a Best Book of the Year for School Library Journal. Blexbolex lives in Leipzig, Germany. He is an enormously talented silkscreen artist who has large followings in the worlds of comics, art, and children's books. Blexbolex lives in Leipzig, Germany. He is an enormously talented silk-screen artist who has large followings in the worlds of comics, art and children's books. His book Seasons was a New York Times Best Illustrated Book of 2010 and his book People won the Goldene Letter Award in 2009 for Best Book Design throughout the world.